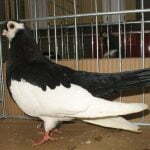 The Escampadissa pigeons– also known by the name: Эскападиска – is a varietal originating from the Balearic region of Spain, and is an ancient race originally thought to have been known since the 1800s. Some breeders believe that the varieties belonging to this tumbler pigeons type have Oriental Roller blood descendants. This variety is known for its ability to fly very high, and if in a group, they will perform a unique and fascinating escampant style attraction – some seem to drift without weight. Generally also these varieties fly very quickly, because the initial exercise is to avoid predators.